Sophia, Olivia, and I found four caterpillars on my parents’ carrots in their vegetable garden on July 2nd. The girls were excited to see different caterpillars than the monarchs that they’ve raised during past summers. These caterpillars are much bigger than monarch caterpillars. Notice the thin silk thread that it made. 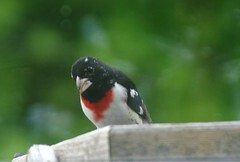 It attaches to its body and the stick. 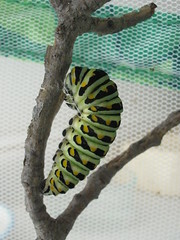 When we came home, I looked up on the internet the type of caterpillar and what the butterfly will look like. Found out they are the black swallowtail butterfly that like to eat plants in the carrot family. The first butterfly had already transformed itself in two days. Notice how it it blends in with the background. is on the right hand side. Found out that the black swallowtail caterpillar will make its cocoon similar in color to its surroundings. 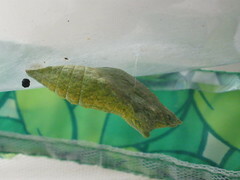 Three of the cocoons are green and one is brown (the caterpillar chose to make a cocoon on a stick). All of the cocoons are held in place by a very thin silk line. Once the butterflies emerge, the pictures will be added to this post so the life cycle is shown in one place. 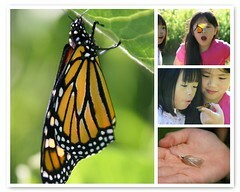 This is the second year that the girls have raised and released monarchs. Last year, there seemed to be a lot more caterpillars than this year. Read an article during the summer which said that for some reason people were noticing a decline in the number of monarchs. With fewer butterflies, they wondered what next year would be like. That being said, the caterpillars the girls did find in the backyard were fascinating to watch. They have an indoor screened cage where they raise the caterpillars. Each day, they pick fresh milkweed leaves and put them in the cage. They watch the caterpillars grow rather rapidly…and then make the crawl up the side of the cage. “They’re in the ‘J’ position!” I’ll hear one day. They watch…and wait. Take a break. Come back later…and watch….and wait. One of the caterpillars last year they were able to see change right in front of their eyes. It’s an amazingly quick process. 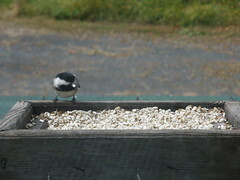 This year, they saw the tail end of the change which was interesting for them to watch. After about 20 days, the butterfly emerges, dries off its wings, and the girls bring in fresh flowers for the butterfly to enjoy. 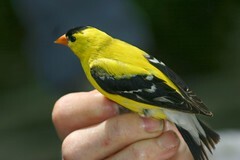 They keep it inside for less than a day, and then release it towards the evening. This year, two of the butterflies stayed around for a rather long time, giving the girls the opportunity to observe them. One of the butterflies each put on a little “show” for the girls by fluttering right in front of their faces. They can read about monarchs in a science book, but for them to actually raise, touch, and release these beautiful butterflies first-hand is invaluable. These are experiences that they will remember! June 1st marked the first day that we spotted a monarch here in Minnesota. Since then, the girls have been looking for eggs on the bottom of the milkweed leaves to see if there are any. 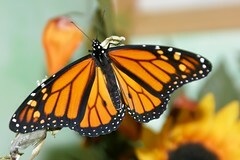 This year we are planning to go out more often and look for eggs and caterpillars, so we can raise more monarchs. It is such a fascinating process to see them move through the stages from caterpillar to butterfly. Visit http://www.flickr.com/photos/picturesbyann to see more pictures of the caterpillars in various stages of growth and the release process. This evening on our nature walk, we spotted two more monarchs! A nice way to end the day.